The dark and dull days of winter are still upon us, willing us back to bed and desaturating the world in shades of grey. With the 24th of January (‘Blue Monday’) supposedly being the most depressing day of the year, you’ll need a little bit of perking up. 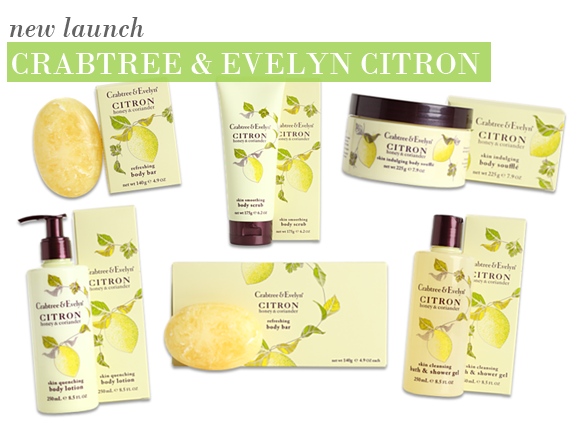 Crabtree & Evelyn’s brand new Citron range is as refreshing as a glass of icy cloudy lemonade, a tonic to the deary and the dull. Transport yourself from the bathroom to a Mediterranean citrus grove, and let the sun shine in…. A blend of purifying rosemary, thyme, tea tree, eucalyptus and coriander to invigorates the senses. To save you from dryness, a blend of shea butter and primrose oil keep the skin supple and soft. A natural-based scrub containing 18% botanical oils (sunflower, soy, jojoba) for a truly moisturising exfoliation experience. Granules of sunflower seed wax effectively exfoliate the skin, removing dead cells and dirt, leaving the skin refreshed and revitalised without dryness. Luxuriously moisturising yet light and whipped in texture, this gorgeous blend will deeply hydrate the skin to leave it radiant and dewy. Glycolic acid and AHAs derived from sugar, oranges and lemons condition the skin, evening out skin tone and texture. Rich moisturisation in a lighter texture, created with fruit and sugar extracts to smooth and make skin silky. Extracts of fig, apricot and pumpkin nourish skin wonderfully, leaving it touchable soft and beautifully fragranced. The ideal way to start your day, a tonic for beautifully radiant, happy skin.With its invigorating scent of citrus fruits and sugar, the rich lather with leave you feeling fresh and fruity, with added glycerine, aloe vera, honey and tea extracts to effectively moisturise the skin. This entry was posted on Thursday, January 20th, 2011 at 9:37 am and is filed under Bath & Shower, New products. You can follow any responses to this entry through the RSS 2.0 feed. You can skip to the end and leave a response. Pinging is currently not allowed.